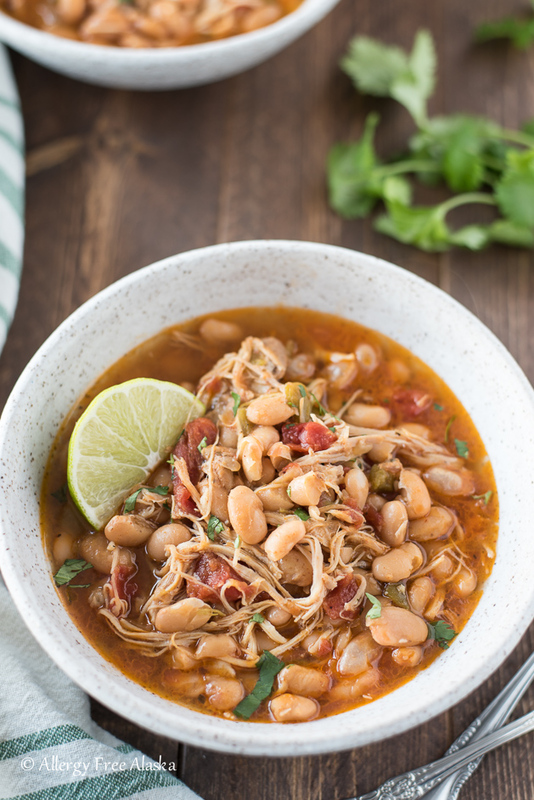 This Instant Pot White Bean Chicken Chili recipe is so easy and filling. It’s the perfect quick meal the entire family will love, made with ingredients commonly already found in one’s pantry. This recipe is actually the result of not having anything planned for dinner one night. I literally threw ingredients in my Instant Pot on a whim, hoping it would turn out okay. To my pleasant surprise, it was absolutely delicious! I’m so thankful I wrote the recipe down! 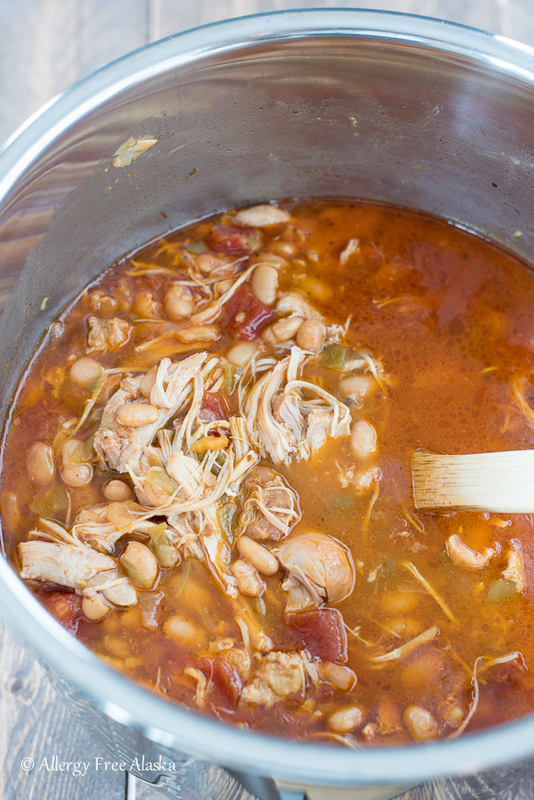 From the pantry, I use dried navy beans (or great northern beans, either white bean will work), chicken broth, canned tomatoes, canned green chilis, and spices. From the freezer, I use frozen boneless, skinless chicken thighs. The Instant Pot cooks the frozen chicken thighs to perfection, so they are tender and easy to shred apart with a wooden spoon. I don’t know about you, but I find using frozen chicken thighs vs. thawed extremely convenient. I often forget to pull meat out of the freezer for dinner, so this easy white chicken chili recipe is ideal for when you don’t necessarily have a ton of time. It only takes about an hour and a half from start to finish – with minimal ingredients. Perfect for when you want to dump everything in the Instant Pot and walk away! Q: Should I use dried navy beans or great northern beans? A: Either dried navy beans or dried great northern beans will work in this recipe. It just depends on what you have on hand in your pantry, or what you prefer. Great northern beans are bigger, and creamier, so if you tend to like a creamier chili, you might elect to use those instead. Q: Can I substitute vegetable broth for the chicken broth? Q: Why does the recipe call for cassava flour? Can I omit it or substitute something else? A: Cassava flour is added as a gluten-free thickener, since I don’t use cornstarch in my cooking. In the pictures of the white bean chili you see in this post, no cassava flour or starch was added (I just didn’t have it on hand at the time), so it’s a bit more soup-like. Adding cassava flour, or another starch, like corn starch, will result in a thicker chili. You can omit the cassava flour altogether, or substitute something in its place, like cornstarch or arrowroot starch. Q: Can I make this Instant Pot chili recipe in the crockpot or slow cooker? A: Yes! Cooking time will vary depending on your crockpot or slow cooker, but I’d estimate 4-6 hours on high, or 5-8 hours on low. Q: Can I soak the beans overnight first? A: Definitely! If you do choose to soak your beans overnight, I’d reduce the amount of chicken broth used to 2.5-3 cups. Q: Why do you add bacon fat, lard, or vegetable shortening to the chili, and can I leave it out if I want? A: I add fat to the chili for 2 reasons – 1.) Flavor. Fat always adds flavor, especially when it’s leftover bacon fat. 😉 2.) Fat adds a creaminess or smoothness to bean recipes that I personally enjoy. If you are eating low-fat, or would rather omit the fat from the recipe, you definitely can do that. Q: Can I substitute frozen chicken breasts for the frozen chicken thighs? A: Yes. I prefer chicken thighs because I find them to be more tender and juicy, where chicken breasts are more dry. But again, this all comes down to personal preference. If you do want to use chicken breasts, I’d use 2 of them in this recipe. 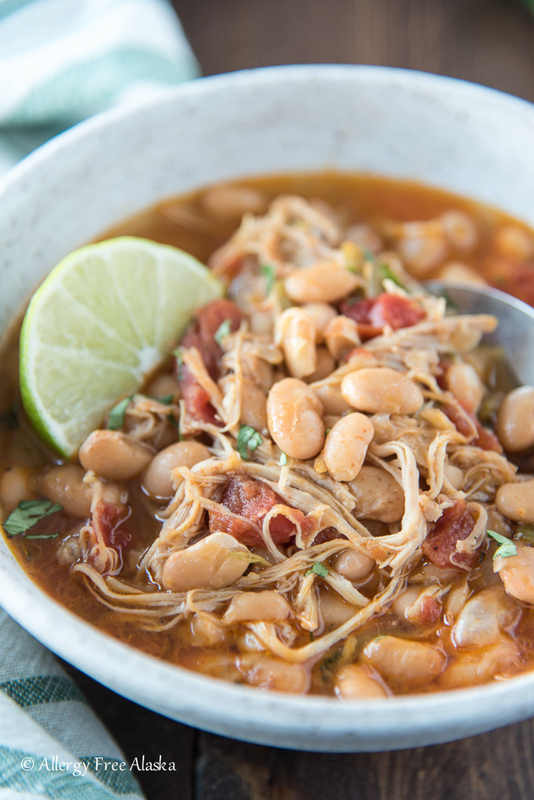 What to serve with White Bean Chicken Chili? 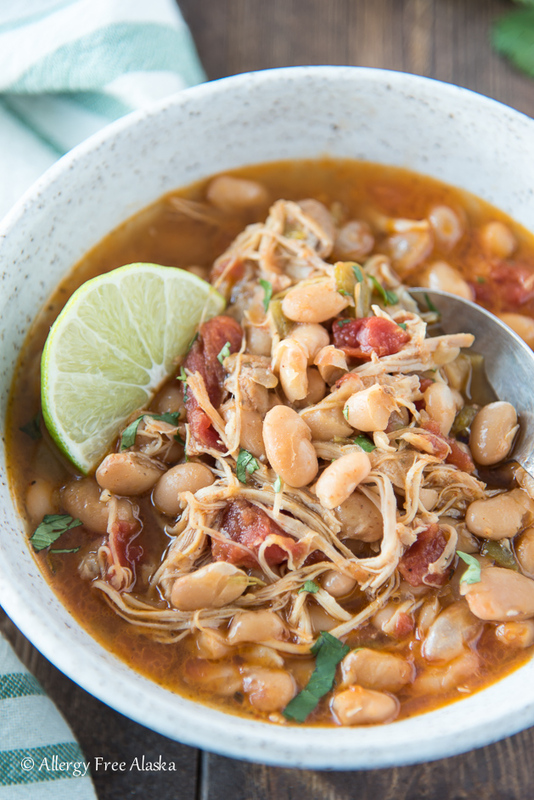 My family eats this White Bean Chicken Chili over rice and/or with corn chips, cilantro, and chopped avocado. If you’re looking for something hearty to serve along with it, try this gluten free Sweet Cornbread, or these gluten free No Corn Jalapeno Cornbread Muffins. For freezing, I wait until the chili is completely cool, and then I portion it into gallon-size resealable bags. This way they freeze flat on the shelf in my freezer and are easily stackable. Alternately, you also could use these glass snap lock containers (I own these and love them), just make sure you you only fill them 3/4 of the way full, otherwise when the chili freezes and expands, it will break the containers. What Instant Pot model do I buy? I’ve owned my Instant Pots for over 3 years now, and actually have 2 of them. I have the 7-in-1 DUO 6-quart, and also the 8-quart model. I prefer the DUO to the LUX model because the DUO has the yogurt function for making recipes like my Easy Coconut Milk Yogurt. If you have a family of 4 or larger, I highly recommend getting the 8-quart model. The 6-quart works for my family of 4, but with friends coming over, or if you entertain for large groups of family and/or friends, the 8-quart fits so much more food. Don’t want to pay full price? Watch for sales. Amazon will often times run sales during Black Friday, or at other spontaneous times throughout the year. I’ve heard Kohls and Fred Meyer also run good sales from time to time. 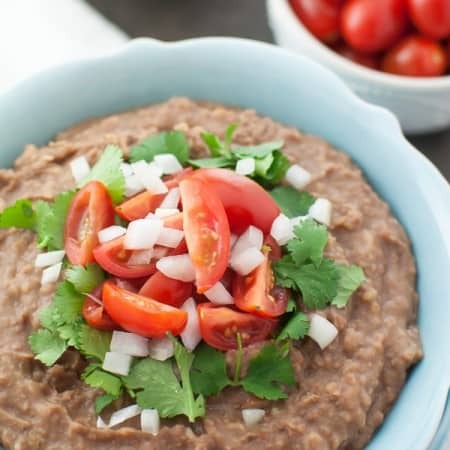 I use my Instant Pot most often to make my Refried Beans and my Paleo Pulled Pork. Both of these recipes make large amounts of food, perfect for freezing for future meals, or for parties. 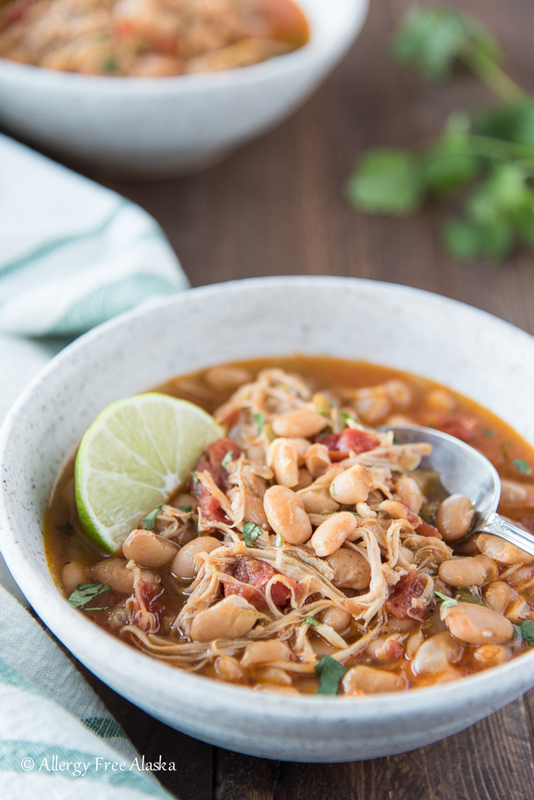 This Instant Pot White Bean Chicken Chili recipe is so easy and filling. It's the perfect quick meal the entire family will love! In a large mixing bowl, add the sorted dried navy beans and fill the bowl with enough water to cover the beans by several inches. Set aside to soak while you prepare the remaining ingredients. To the Instant Pot bowl, add the chopped onion, garlic cloves, cassava flour, chili powder, ground cumin, ground coriander, dried oregano, ground black pepper, canned diced tomatoes, canned diced green chilies, and chicken broth. Use a colander to strain the beans and discard the soaking liquid. Rinse with fresh water. Add the beans to the Instant Pot bowl, and stir all of the ingredients together. Add the chicken thighs to the bowl, and push them down into the liquid. It’s okay if they aren’t completely covered in liquid. Now add the lard to the bowl. It’s okay if the lard is in a solid lump, as soon as the Instant Pot comes up to pressure/temperature, the lard will melt. Place the lid on the Instant Pot and ensure the steam release valve is set to sealing. Press the “Bean/Chili” key, which will show 30 minutes of cooking time, and then increase the time to 45 minutes. Now walk away. When the Instant Pot is done cooking, let it cool down/warm for 15 minutes, and then flip the steam release valve to venting, to let the Instant Pot come down from pressure. When the pressure is released, open the lid of the Instant Pot and use a wooden spoon to stir the chili and break up the chicken into small pieces. Taste, and season with sea salt if needed. The chili will appear soupy, but will thicken as it cools. I like to pull my Instant Pot bowl out and place it on top of my oven to cool for 30 minutes and allow it to thicken. Serve warm with cilantro, avocado, and rice or corn chips. See blog post above for recipes substitutions and questions. Can you tell me why the lard is necessary? Anything else you can use in its place, like ghee? This recipe looks great but I’m not a fan of lard. I’m sure the lard is to keep the pot from boiling over. You could likely use any heavy oil. This looks so good, perfect for cold days! I don’t have an Instant Pot, but I am intrigued! I’ll have to look into it. I’m glad you’ve been feeling good! I’d love to make this but don’t have and can’t afford an instant pot. 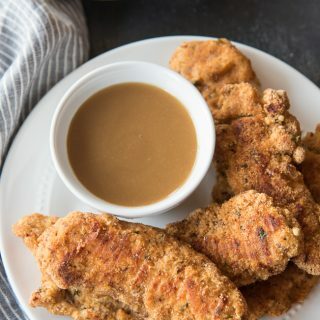 Is there a way to make this in the crockpot instead? So I made it a few days ago following the recipe fairly closely, except that I don’t have an Instant Pot, so I just cooked it stovetop, which worked fine. I did stray from the recipe a little: I doubled the chili powder, and the package of chicken thighs my wife got at the market only had 5 thighs. And the bag of beans I used (Goya brand) were labeled “small white beans – habichuelas blancas”, but I think they were the same as navy beans– they looked and tasted like navy beans. Otherwise, ingredients as listed, including the cassava flour and lard. It turned out very well– quite tasty. Thanks for posting it. Thank you so much for your comment, recipe notes, and cooking tips! This is great information for anyone who doesn’t own an Instant Pot. The Instant Pot intensifies flavors as it cooks under pressure, so I’m glad you took the liberty to adjust the chili powder to your taste on the stovetop! I’m very happy to hear you enjoyed this recipe! This looks so good!!! Thanks so much for sharing it with us at Savoring Saturdays linky party! I’ll be featuring it as one of my favorites this week. Hi! I followed your recipe to a “T” in my new Instant Pot. Some of the beans were still hard after the 30 minutes of cooking and 15 minutes of cooling down. Suggestions? I’m sorry to hear that! I’ve never experienced that issue when I’ve made this recipe. That said, I’d recommend lengthening the time cooked, maybe by 15-20 minutes next time. I had a few that were not quite done as well as I liked too. I plan on increasing the cooking time the next time I make it. It was still fabulous though! I’m not sure how long I’ve had those beans, so that could be a factor too. Hmm… it might be the beans. My SIL recently had that happen, not with this recipe, but she slow cooked a batch of beans all day, then pressure cooked them, and still couldn’t get them to turn soft. It’s a bummer sometimes we don’t know how old the beans are when we buy them! Regardless, thank you for your recipe notes, Dawn. I think I might up the cooking time on this recipe by 5 mins, just to ensure more even cooking. This is exactly why I’ve been reading through the comments. To my knowledge, the acid in the tomatoes prevent the beans from softening, or make it take much longer. So I couldn’t believe I found a recipe with dried beans and tomatoes, but thought maybe it’s that magical instant pot! I think I’ll try the recipe, but add the tomatoes later. I was just fixing to comment that any Recipe with Dried Beans in it , And Tomatoes will definitely cause Beans that will not Softened..I’m just surprised that the Friendly Author of this Recipe never had a problem with Beans that would not get soft. I haven’t had that issue at all, Cindy! Granted, I make sure I buy beans and then immediately use them. I don’t keep them around to stale. I have found that if the beans are old they might not cook properly, I also found this information on the US dry bean councils website…which may confirm my belief. Always use fresh dry beans if possible. Beans that have been stored for over 12 months or in unfavorable conditions may never soften. Hard water may also cause hard beans. If the cooked beans still seem tough, add a 1/4 teaspoon sodium bicarbonate (baking soda) for each pound of beans to increase tenderness. While adding baking soda is an old trick, remember that the ingredient also may over-soften fresher dry beans, causing mushiness. Add acidic foods, such as tomatoes, vinegar, lemon or calcium-rich molasses, near the end of the cooking time, because these ingredients may toughen the skins. Practice this in our Tuscan Bean, Tomato & Bread Salad recipe. Add salt just before serving to avoid toughening the bean skins. Bought the beans a week ago. Pressure-cooked the recipe twice. First time for 40 minutes (beans were still bullets). Recooked for another 10 and still beans were not done. I have Psa and I’m on Remicade and Otezla. I’ve never even heard of LDN. Going to google it now. I know this thread isn’t current but just wanted to let people know that I have been on LDN for 8 years for MS and have never had a reoccurence of the issues that led me to an MS diagnosis (optic neuritis, brain fog, achy-ness, lethargy. I do still have migraines but not too often. I think a gluten free, low dairy and low sugar diet is important for optimal results. After all: all auto immune diseases are caused by inflammation and while LDN is great at bringing down inflammation it won’t work if you are eating highly inflammatory foods. It really is a pity that doctors don’t look into it better. Can I use canned beans instead? I developed this recipe specifically for dry beans. You might be able to use canned, but I’m not sure what the IP cooking times would be for that. I’m sure you’d have to reduce or possibly eliminate the liquid. You’ll have to experiment with it! I got an Instant Pot for Christmas and this is the first thing I’ve made. Your instructions were clear and easy to follow. Delicious! Everyone enjoyed it. Thanks. Hi Micah! So happy to hear that! 😉 You’re very welcome! YUM! This looks great Megan… can I sub breasts for the thighs? I too got an instant pot for Christmas and this was the second recipe I made. I like it but found that the flavor was too bland. Not sure if I did something wrong? I added doubles of all the seasoning and some chipotle pepper afterwards and its yummy. You are so welcome! I’m so happy you both enjoyed it. 😉 Thanks for coming back here and leaving me a comment! This was delicious! I made a few modifications to suit my dietary needs (and the contents of my pantry) but it was fabulous. Just curious, what do you consider a serving? I have to be mindful of carbs, so as much as I’d like to just pile my bowl full, I need to measure unfortunately. Thanks for the great recipe! My hubby, who is not fond of beans OR soups, said it was really good. So happy you and your husband enjoyed this! Hmm… what do I consider a serving? That’s a tough one. Maybe a cup? Just found your recipe today and looking forward to making it tomorrow. My chicken thighs aren’t frozen, I could put them in the freezer overnight, but is that necessary? Thank you! No, it’s not necessary. While I haven’t made this recipe with thawed thighs, I’d think it would all be just fine. 😉 Hope you enjoy it! 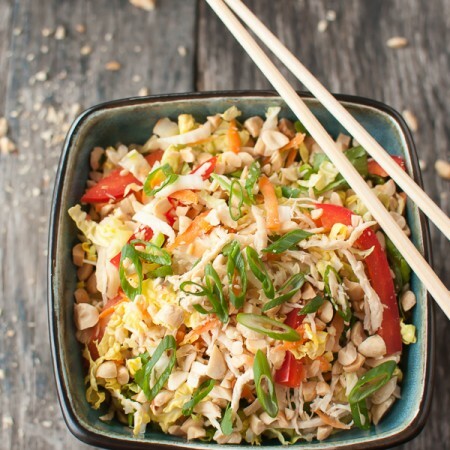 have you tried avoiding tomatos and other nightshades with your autoimmune issue? This is possibly the best white chicken chili I have ever had. Wow, it is insanely good! The only thing I did differently is add 2 10 ounce cans of original Ro-Tel tomatoes with chilies because my market was out of canned green chilies and I didn’t want to run to a different store. Anne, thank you so much for leaving your comment! It made my day. 😉 I’m very happy you loved it! When I was pregnant with my oldest, she’s 5 now, I constantly craved the white Chicken Chili from The Cheesecake Factory. Soon after having her, we started eating more whole clean foods. I have been searching for a go to recipe since! I have tried so many and I think I finally found the one! This is so good! The only thing I excluded was the lard (I used grass fed butter, but not sure if I needed it) since I don’t really use it. This is so good, thanks for sharing. Followed the directions to the T and beans were all perfect. What is the quart size of the pressure cooker you are using for this recipe? I ask because this is my first time using my new pressure cooker (5 QT) and my manual says to not fill any more than 1/2 full when cooking anything that expands. I would love to know the size you used prior to proceeding 🙂 Thank you! Do I need to adjust anything if using fresh (not frozen) chicken? I’d still keep it at the same time! What do you think about using bone-in thighs. Any suggestions on adjusting cooking times? I think it could work. I would add an additional 5-10 minutes of cooking time though! I’m excited to try this! I do not like dark meat… could I sub chicken breasts? And what would be an equivalent amount of breasts to the chicken thighs in this recipe? Thanks! Hi Whitney! Absolutely, you can substitute chicken breasts instead of thighs. I would do no more than 3 chicken breasts, but thaw them enough that you can cut them in half. Breasts are much bigger than thighs. Tried this last night and it was delicious. The only thing I did different was to cook a whole chicken in 1 cup of chicken broth in the instant pot first. I then separated the fat from the broth and used that broth in the chili and added additional store bought broth to add up to the 4 cups. I then followed your recipe exactly, adding the precooked chicken to each bowl and ladled the cooked chili on top which rewarmed the chicken. Made this today following your directions. Added butter instead of lard as one of your readers did. I also did a quick soak on my beans prior to putting in the pot. I had more chicken thighs so added a little more time. My pot was almost to the top line which made me nervous but all was well. I cooked for 50 min. & released for 15. Everything was delicious. Beans were done. Chicken melts in your mouth. Big fan of INSTAPOT ! You’re welcome, FrankieLee!! Very happy you enjoyed it! Hi Megan, Do you think increasing the broth would affect the recipe? 4 cups to a pound of beans and 6 thighs doesn’t seem to be enough, the photo looks more soupy than that. It would definitely make the recipe more soupy if you use more broth. 4 cups is plenty. You have to remember the Instant Pot isn’t a crock pot, where the liquid evaporates. Is it necessary to use lard or vegetable shortening? Is it for flavor or does it serve another purpose? This recipe sounds delicious and I’m anxious to try it but don’t have lard or shortening and didn’t want to spoil the recipe. Trying to decide if I need to run to the store. Thanks? No, you don’t have to use the lard if you don’t want too. Extra fat just makes the beans creamier/richer. It would spoil the recipe if you leave them out. I’m excited to try your recipe for white chicken chili that I found on Pinterest. Unfortunately, the recipe there does not have any directions, just an ingredients list. Maybe I’m blind, but when I followed their link to your site, I didn’t find the recipe itself, just personal comments and mentions of the recipe so am still looking. I am new to the instant pot, have not yet tried mine out, so am afraid to wing it. Would you leave me a link to the recipe that includes directions? I was excited to find one that uses dried beans, and yours sounds like a winner. Thank you for your help. Good luck with you health challenges. Nevermind! I found it! I don’t know why it didn’t come up for me before. Anyway, I’m good now! This was delish! Instead of adding cassava flour (I was afraid it would get gummy in the pressure cooker) I added cornstarch but waited until the end. I simply added a few tablespoons mixed with half a cup of water and set the cooker on saute and stirred until thickened. This also allowed the chicken to shred. Also, I added more chicken stock so the cooker would be sure to reach pressure since there were reports of it not having enough liquid to reach pressure. This recipe has become a winter staple in our house, and a superbowl tradition! Do you have the nutritional information for the chili? No, I don’t, but you can easily find that information out by using a calorie counter online. I made this last night for my lunches this week. I didn’t know what it meant when it said to “sort” the beans…learned after the fact that it meant to separate the shells/skin once they start to hydrate. I didn’t add any lard or extra fat and it still tastes delicious! Thank you!! Not terribly so. My youngest is super sensitive to spice, and she’ll eat it. It’s very mild. That’s frustrating. Sorry, Bonnie. The bummer is that you never know how long those beans had been sitting on the store shelf for! This came out perfect and so delicious! I needed a relatively quick meal and found this recipe. I have made it quite a few times since and love it every time. Most delicious and easy dish! Thank you for the great recipe! We are serving this along with Colorado chili for my honey!!!!! Hi Jaci! Thank you so much. Glad you all enjoyed it!